Several years ago, I saw this Moon'doc CD listed for sale as a new release while browsing one of my regular online music stores. On a whim, I took a chance on this CD based on the fact that former Accept guitarist Herman Frank was in this band. The blurb about this CD on the website from which I bought the CD also made Accept, Victory, and Helloween comparisons to Moon'doc. Being a big Accept fan and a sucker for those comparisons, I took a chance on this CD, and am very glad that I did. For whatever reason, Moon'doc never seemed to catch any steam whatsoever in the metal community until their final album, Realm of Legends. While an excellent album, neither of the bands first two discs seemed to catch on. While I find all three albums to be solid, Get Mooned is absolutely the band's shining moment, and one of the finer albums in my collection. Predictably, the guitar work on this album is slick and everything I would have expected from the likes of Herman Frank. Upon first listen to this album, I was surprised by the quality of the lead vocals on this album. For a relatively unknown and minimally promoted album, this guy really impressed me. Of course, I am referring to Chris Bay who sang on the first two Moon'doc albums, and then left for Freedom Call. Only after Freedom Call's career took off like torpedo in the late 1990's demand for this album spiked a bit. For fans of hard rock bands such as Axxis, Gotthard, Shakra, and Talisman, you should find a lot to like here if you don't already have this in your colleciton. Naturally, fans of Accept and Freedom Call will be interested because of the Frank / Bay involvement, although the music at hand doesn't reflect Accept or Freedom Call in a big way. Get Mooned is a great slab of melodic hard rock that blends in a healthy dose of melodic metal. Plenty of bands have been blurring the melodic hard rock / melodic metal line for years now, and Get Mooned is a great example of what it sounds like when done right. What remains constant is the band's ability to lay down song after song that feature excellent arrangements and individual performances. The album maintains an addictive sense of melody that does not compromise the heaviness of the sound one bit. The chorus lines are not over the top, but they do a great job in driving home the melodic quality of the songs with a punch. The title track is the heaviest track of the album; the most Accept like track of the album. Chris Bay pulls off very nicely some slightly aggressive singing here as well. In general, Bay's delivery is definitely less "happy" than what Freedom Call fans are accustomed to, and he mixes in some more aggressive, gritty performances from time to time on this album. Still, the soaring, powerful, and highly melodic qualities of his voice are present on this album, and play a huge part in bringing each of the songs to life. As I touched on above, Herman Frank's guitar wizardry is another key component of the band's sound. Catchy riffing that straddle the hard rock / melodic metal line are the foundation of each of the songs. The soloing throughout is top notch, as they are just as emotional and expressive as they are sharp and energetic. Furthermore, Frank adds a plentiful dose of shedding here and there as the songs call for, which really puts the guitar work at the forefront of the sound alongside Chris Bay's vocals. Still, you can't ignore the fact that Moon'doc simply wrote great songs for this album. On top of that, the band never repeats themselves and you certainly won't hear any "copy-paste" elements to their music once you get deep into the album. Uptempo cuts such as the title track, Out In The Cold, and Can't Stop Loving get the blood moving, while the dark and groovy Take It Or Leave It provide a surprising, but well performed diversion. Message to Mum and Shy Boy are the closest tracks to a ballad on this album, but they aren't quite that mellow. Both are good songs, but nothing more. Energetic mid to high tempo rocking metal is what this band does best, no doubt about that. Aside from that, it's impossible for me to name a weak or filler track, simply because there aren't any. With fourteen tracks on this album, you really get a solid hour's worth of music with this album. Lastly, the sound quality of Get Mooned is well balanced and extremely sharp, without sounding over produced. Frank's guitar work is really allowed to shine, while the bass guitar provides a bold bottom end to the sound that sounds great coming from your subwoofers without having to go nuts with your EQ. Everything is at just the right level, meaning that this sounds like a big budget, major label release. Sometimes reaching back in time allows you to rediscover an old gem that you haven't visited in some time. 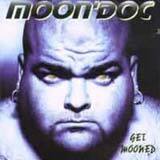 Get Mooned is a staple for what melodic hard rock / melodic metal is all about. Excellent individual performances, thoughtful and varying arrangements, and an excellent sound quality will have you hooked upon first listen.